I waited and waited for perfect tomatoes and juicy, ripe nectarines to arrive and for my own basil to grow. All those things came to be last weekend, and I was able to put together this lovely, summer salad. Once again, this is from the book My Favorite Ingredients . I wasn’t kidding when I said I marked several pages. As you see in the title, this salad is intended to include prosciutto, and Kurt’s portion did indeed have some in it. I don’t eat red meat, so I left it off my plate, but Kurt commented that having a little prosciutto is never a bad thing. For the cheese, I was torn between a very nice buffalo mozzarella and burrata. In the end, I used a little of both in the salads. 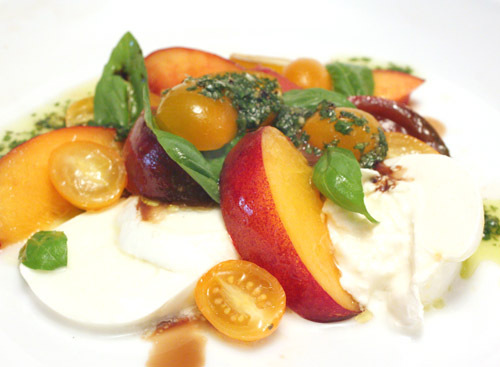 The tomatoes, nectarines, and cheeses were drizzled with basil oil with garlic, and then everything was dotted with aged balsamic. Just the other day, I brought home an eighteen year aged balsamic from Con’Olio which is a locally-owned olive oil and balsamic vinegar shop with incredible varieties of both, and this was a perfect use for it. This is exactly the kind of dish in which quantities and exact ingredients don’t matter so much, but the quality of each item on the plate is everything. I’ve made basil oil before, but this version was a little different. The basil wasn’t blanched this time, and the raw leaves were pureed with chopped garlic. Once they were minced, olive oil was added. For the salad, I used nectarines and an heirloom tomato which were simply cut into wedges, and I added yellow cherry tomatoes which were cut in half. The nectarines and tomatoes were tossed with olive oil, lemon juice, and salt and pepper. The mozzarella and burrata were cut into big pieces and plated, the nectarine and tomatoes were spooned on and around the cheeses, the basil oil was spilled on top of it all, and the aged balsamic was dribbled here and there. I added a few basil leaves, and Kurt’s salad was adorned with prosciutto. It is really just a caprese salad with added hits of sweet and salty from fruit and cured meat. But, when the ingredients are as good as they can be, it’s a salad that’s perfection. I couldn’t decide which cheese I preferred. Both were excellent with the mix of things on the plate. I did decide that this could be my dinner day in and day out for the rest of the summer. That is such a colorful and delightful salad! those yellow grape tomatoes are so incredibly sweet!!! what a great combination of flavors!! This sounds like a very healthy salad. I admire you that you grow your own basil. The sauce with basil, garlic and olive oil sounds so appetizing. I love fresh mozzarella. I've never thought to pair nectarines with grape tomatoes, but I like the idea of the contrast. I also like the basil garlic dressing. I am so impressed that this came from your garden! It looks fantastic! baking.serendipity: Only the basil came from garden. I wish I could tomatoes and nectarines! I do have one cherry tomato plant this year, but I mostly just grow herbs. Thanks for sharing this recipe. I don't think I would've thought to paired tomatoes and nectarines together in a salad otherwise. Honestly, being introduced to these types of new pairings is one of my favorite things about the interwebz. Wonderful looking salad! Love the twist on the traditional caprese salad. I bet the nectarines were simply amazing in the salad. Thank you for sharing! Lisa this is perfect. Thanks for the wonderful ideas you are giving us here. I can imagine this salad with some arugula as well as feta. this looks absolutely beautiful! 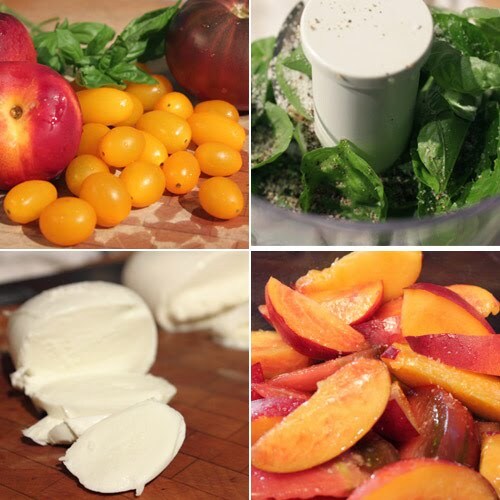 such fresh and summery colours, and there's nothing much better than fresh mozzarella! Lovely! Lisa, this is one perfect salad! Arugula, nectarines, and tomatoes...all the fresh and seasonal fruit and veggies. Just irresistible! All I can say is "great minds think alike". Love the melon with the salad and mozzarella. Hi Lisa! Wow, that is summer on a plate. There is an olive oil/vinegar store right around the corner from my office, I'm going to see if they have that same kind of balsamic that you used. this salad displays the epitome of bright colors and flavors--bravo, lisa! I love that we both made mozzarella salads over the weekend. I love the fruit in yours!! This is so fresh and colorful - just the way I like my salads. And the combo of flavors is irresistible! What a beautiful photo! This looks fabulous! What a beautiful colorful salad! 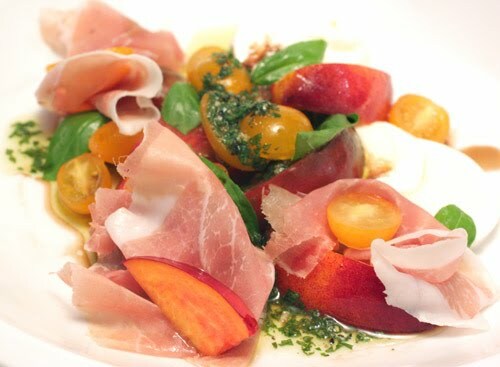 I love the combination of fruity nectarine & tomatoes with prosciutto! Perfect! This salad just sounds amazing. I just smoked some peaches to make a salad and I bet they would be lovely in a version like this. You've given me some wonderful ideas. this is such gorgeous salad....love all the ingredients you're using...so summery and fresh. MMMMM,..this is certainly my kind of summer's salad!! I do love fruits with my prosciutto & buffalo mozzerella!! there is nothing better,...and a good glass of Italian dry white wine! This is a great, summer salad. The idea to add nectarines is very good. Fruits usually go very well with mozza. take care! What a gorgeous summer salad - it would be perfect for a dinner party!